You don’t want your customer to be a one-time buyer. Your business would be short-lived. Instead, you want to continue to engage them in your products or services, especially if you have ones that are superior to what they’ve already purchased. They might be superior because they offer a better customer experience. They might be superior because they tend to get better reviews and word of mouth referrals. Or, heck, they might be superior because their profit margins are higher than the other products your customers are currently choosing. And those profits drive ever better products and services down the line. Upselling your audiences on these more expensive or premium services is certainly important. How and when you upsell is critical, especially when it comes to merging customer service conversations with upsell opportunities. Upsell: To encourage your customer to buy a premium version of a product or service they already have, or encourage them to add-on to what they already have through extra services or features. Cross-sell: To promote a different product or service your current customer may also benefit from, related to their original purchase or not. There’s a big difference between “If you like X, you might also like Y” (cross-sell) and “You’re currently paying for X, but for more money, you could have Z” (upsell). Today, we’re strictly talking about upselling, when you take that buyer or subscriber from the entry-level version you offer to a premium version. There are numerous times that it is appropriate to upsell your customers. Armed with an understanding of their purchase habits and preferences, you can contact them when bigger, better iterations of your offering is released. Proactively and personally contact customers through emails, direct mail, texts and more. Target existing customers with online advertisements based on their prior purchases or existing subscriptions. Have conversations with clients during regular touchbases, if your service requires contact with your customers on an ongoing basis. Even upsell during the initial check-out process! 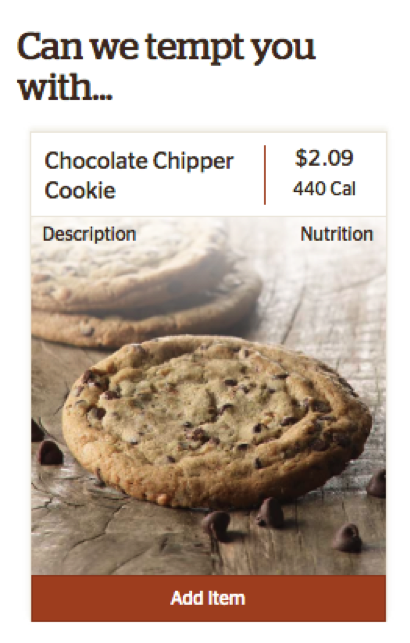 Yes, we DID want a chocolate chip cookie from the bakery with our lunch, Panera, how did you know? These are the most common upsell opportunities, but it is not uncommon for upselling to be considered during a customer-service based conversation. When this happens, tread very, very lightly. Why did they contact you? How did today’s conversation begin? This is a fantastic upsell opportunity. You do in fact offer that feature, on a higher plan or in a newer product. And your customer already likes you, so they’re likely to trust you and give your newer offer some consideration. Would they like to give it a try for 3 months? We bet they might think about it. Customer B is frustrated, and a bit overwhelmed. He thought he was paying for something already, and it turns out that’s not what he bought. What B needs is on a higher cost tier - but now is not the time to have a salesy and promotional tone. B didn’t call you wanting to pay more. In fact, he doesn’t feel what he’s paying for right now is valuable. Consider what you can offer him to make him feel heard, and make him feel accommodated. Customer C just had a bad, bad experience with your product, service or people. They’ve called to complain, because they feel that what just happened was unacceptable. There is no major upselling here. Even if their anger stems from the fact they’re not currently paying for a program that would suit their needs, this moment has just become about client retention. Only in the gentlest of methods would you broach the subject of another (pricier) service that may suit their needs. Consider Customer C’s anger. What if their frustration has nothing to do with the product or service they’ve purchased, but rather because they’re confused about how something works, or they encountered a rude employee at your company? Those issues aren’t solved by an upsell. It’s not a new feature they want. They want to feel more appreciated. These issues are solved by responsive customer service employees who hear, listen to and follow-up on concerns. And once you do resolve them? Let them exit the conversation without pressing them to consider new services from you. They didn’t call to pay more. Allow them to fully return to enjoying what they currently have. Keep in touch. Transition them from a complaining customer to a loyal customer, and then they’ll be more likely to be interested in what else you have to offer them. At the end of the day, the people who provide your customers with high-quality, responsive and personalized service are the ones who will build and strengthen your business’ long-term relationships. Great restaurants don’t need to upsell. Making you feel comfortable has a way of loosening your wallet. While we won’t rule out upselling, the recommendation here has merit. Relationships will evolve over time, as both your business and your customers change, and as your customers begin to trust you and default to choosing you over your competitors again and again. Arm your support people with all of the information they need to know about your customer personas, so they’re prepared to spot instances where upselling would be both appropriate and appreciated.